Will Ozotto ever make a comeback? Ozotto was designed by Toriyama himself and similar to Hatchiyack was introduced specifically for a video game. However, Hatchiyack is more popular (having a classic and remake anime special dedicated to him that TFS has parodied, appearing in Raging Blast 2, and being the inspiration partly for Anilaza). However, Ozotto has been forgotten seemingly. It's fascinating to think about a "lost" classic DBZ villain from DBZ's 90s past so I was wondering: Will her ever make a comeback? 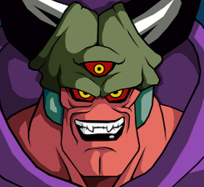 Personally, I think FighterZ would be a perfect chance to bring him back. Imagine being able to transform into different characters during gameplay (similar to Ginyu). It doesn't even have to be FighterZ, it could be a future game. If Hatchiyack was brought more into the mainstream, why not Ozotto? Re: Will Ozotto ever make a comeback? I think the only game that can bring Ozotto back is Dragon Ball Heroes these days, but they don't seem to know about his existence. I'm pretty sure Spike only brought Hatchiyack because of his OVA, they searched and found out him so in order to make their game more noticeable, they included him, remade his OVA and also included Tarble. Ozotto doesn't have one as far as I know. As Grimlock said at this point Heroes is the only way, however as things are he's been completely forgotten and sadly i think is gonna keep being that way forever which is a shame because i really like his design, with that being said Heroes is also pretty unpredictable and random at times so you never know especialy with this Universe Mission coming up. It's likely more than a few of the developers know about Ozotto. A majority of them these days would have been fans who played the games while growing up with the series. The VRVS arcade release was a relatively abnormal project that Sega has partial rights ownership in. When the 3DO port of the game was in the early stages of development, Ozotto was already to be swapped out for Cell. So the issue with him is probably less about who remembers him, and more about who is willing to go through the hassle to negotiate for the rights to use him. They also can't include him in FighterZ for an other reason: Hardware resources. If he would be able to transform into any other character, that would mean, the game would have to load all the models and animations of each and every existing character before each match. The only way they could do it is if he would only be able to transform to the five other characters in the match. Something likes worked in the games like Mortal Kombat back then. Shang Tsung were able to transform, because it was far less resourceful to load all the game sprites. In MK4 they were only able to do Shinnok with loading the other movesets, instead of the 3D models. In FighterZ they wouldn't be able to do that, because it's not just 3D models with animation done with their skeletons anymore, this game has frame-by-frame animetion done with 3D models, with shadows adjusted by hand for each single frame. On the other hand, Ozotto doesn't really have anything else then transformations, he basically has no moveset. They can of course come up with moves for him, but does he even really that much of an interesting design? Well, they can still "revive" him as an alternate costume for Cell in one of the games, or something like. I had in mind the "rights" issue when I wrote the previous comment, but I thought that if Toriyama was the one who designed him, then the character belongs to Toriyama and everyone would be able to use him. Just like both Mira and Towa appear in Extreme Butoden but not Demigra, as the latter belongs entirely to Dimps. But I didn't know Sega also has the rights over the character... That probably means the chances of us getting Ozotto is even smaller than if Dimps didn't simply know about him. Powers at be have gone on record saying Towa & Mira have been overwhelming popular in Japan since their XV revival. It's entirely possible that Demigra didn't make the cut into Extreme Butoden or Fusions simply because he's not as popular. It's an entirely different era in the corporate world than during Ozotto's debut. I don't know the specifics of character rights now. The contracts at the time of Online's development may have been drafted differently to allow Toriyama, Shueisha and/or Bandai Namco to retain rights to the game's original characters even though it was being developed by NTL. The same could be true for modern characters like the Chronoa or #21, since they both will have an exchange of content in XV2 and FighterZ even though they're under different developers. The fact Dragon Ball Heroes hasn't done anything with him, tells me it's more then likely a rights issue. Since Dragon Ball Heroes basically touches on everything. He's certainly not forgotten, he was mentioned in the Dragon Ball 30th Anniversary “Super History Book”, along with a design for his transformation. It's sad that a classic age DBZ character won't get much love in the future. Ozotto wrote: The fact Dragon Ball Heroes hasn't done anything with him, tells me it's more then likely a rights issue. You seems perhaps right because Sega and Banpresto made the game Dragon Ball Z: V.R.V.S. where Ozotto appear.